While the activity is a kid favorite, the adult coloring book craze has taken off since 2015, and shows no signs of slowing down anytime soon. 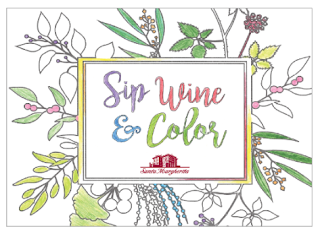 So with, National Coloring Book Day being on August 2nd, why not enjoy this fun, summer-inspired coloring book brought to you by Santa Margherita, to enjoy alongside your favorite varietal! The Sip Wine, and Color coloring book, a fun way to relax after a long day. I personally love the adult coloring books although some are more detailed than I wish, I have always enjoyed coloring. Whenever my kids get a new coloring book I almost always steal a page and color it up myself.